Today, the fire again burned actively throughout the fire area. The main smoke column was not as well pronounced as yesterday however, more acreage was consumed, mainly in the area near North Fork Hat Creek. An accurate acreage count will not be known until the next Infrared observation flight late this evening. As the teams full suppressoin strategy of confine/containment is implemented, resources are being organized and assigned to areas where the potential for success is the highest. These are areas where roads, natural features, and changing fuel types can be exploited for establishing anchor points as well as constructing indirect fire lines. Silver Creek Road on the western flank, is being improved, using feller-bunchers and is being prepared as a contingency line. A combination of crews and dozers worked in the Moyer Basin area in preparation for a potential firing operation. Completion is expected in one more operational period. Efforts to establish an anchor point in the Van Horn Creek area is progressing and water dropped from helicopters are being used to keep flare-ups in check. 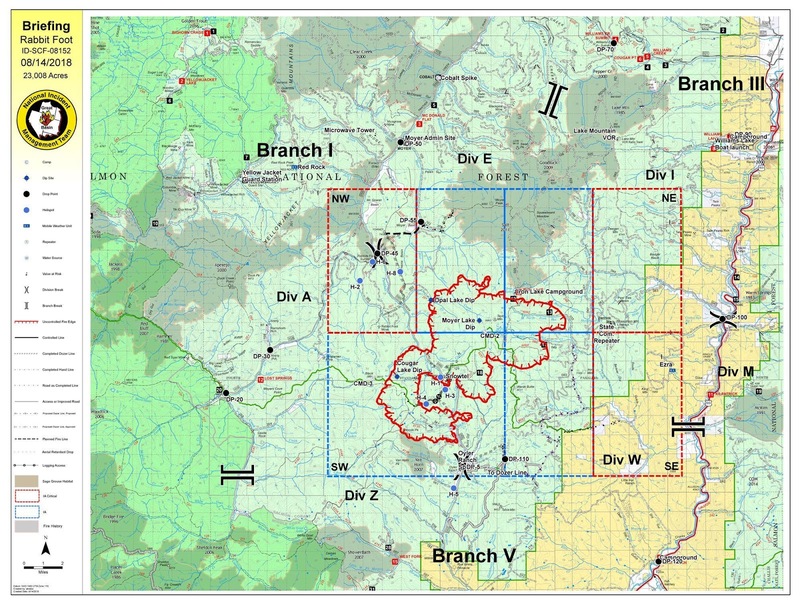 The structure protection and assessment group was active in the Highway 93 corridor and in the drainages of Iron Cr, Deer Cr., and William’s Lake Rd. This group is focused on contingency evacuation planning and in preparation for suppression, as well as point protection in the event the fire moves to the northeast. 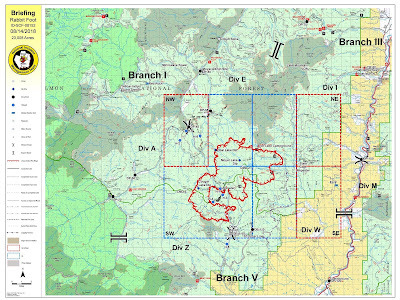 Fire resources were identified for initial attack on new starts occurring within the TFR boundary of the fire. A new start did occur in the Williams Cr. area and rapid reaction by these resources assisted Lemhi County Fire Protection forces in its control. The Public is reminded to be extra careful when traveling and enjoying outdoor activities, fuels are extremely dry and any spark of hot material will start a wildfire.